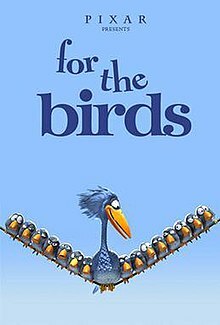 For the Birds is a computer animated short film produced by Pixar Animation Studios and directed by Ralph Eggleston. It won the Academy Award for the Best Animated Short Film in 2001. The film focuses on the difficulty that many people experience in trying to 'fit in' with a group simple because they are 'different'. A) Why are the little birds arguing with each other? B) How do they behave towards the new bird? C) Why don't they want the new bird in their group? D) Why does the new bird insist on trying to fit in? E) How does their prejudice get them into trouble? F) Who gets the last laugh? A) Why are many people so quick to disassociate themselves from people who look different? B) Why is vanity such a strong characteristic in today's world? C) Why do some people persist on trying to be part of the 'cool' group even when they are not wanted? E) Can an embarrasing event, as in this short film, make people change a their opinion about others? The birds don't speak in the film. What do you think they would say if they could speak English? 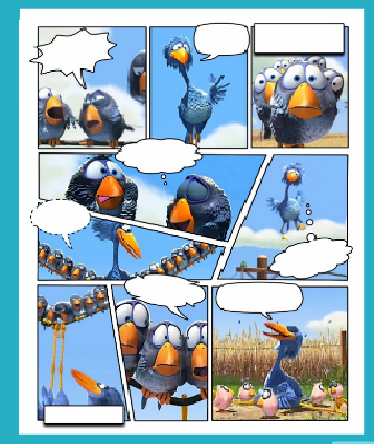 Create your own conversation between the birds using complete sentences. Onomatopoeias can be added to your conversation.